The BlackVault CA (Certificate Authority) is a fully functional CA application. It is utilized to provide strong assurance of identity by issuing and managing public-key certificates. Certificates are generated within secure software and trusted hardware with private keys stored in the tamper reactive cryptographic boundary of the integrated HSM. The BlackVault CA ensures both maximum security and operational simplicity. Powerful and intuitive, the BlackVault CA is the right choice for highly secure certificate authority operations. The BlackVault CA securely boots up as a secure certificate authority server running inside of a tamper reactive cryptographic boundary. All cryptographic functions, including private / public key generation and certificate signing are performed inside FIPS Level 3 protected hardware. The cryptographic algorithms are also FIPS certified and use a sophisticated NIST hardware random number generator to ensure key entropy. Private keys are never in the clear; including key backups where keys are encrypted. The BlackVault CAsecurely boots as a Certificate Authority and can be configured as a root CA with self-signed certificates or a subordinate CA with chain of trust to the root CA. Unlike general purpose operating systems and standalone HSMs, the BlackVault CA powers on in CA mode while automatically linking all CA functionality to its highly secure HSM cryptographic boundary. 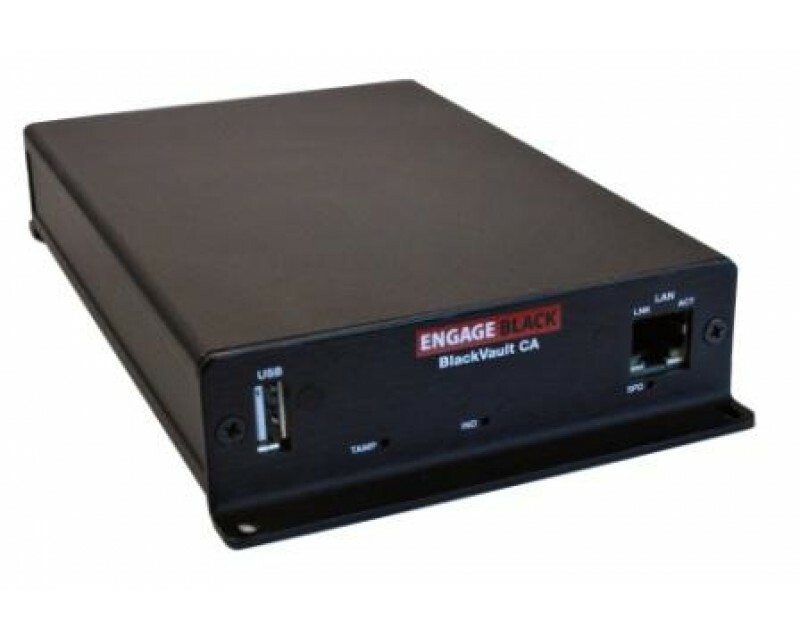 The BlackVault CA supports both networked and off-line (air-gapped) applications, and is easily transported to a secure room or safe without loss or compromise of cryptographic material. It also delivers the latest secure CA features, including Enrollment over Secure Transport (EST) protocol, as well as OCSP, and a full suite of advanced cryptographic algorithms (including Suite B). The BlackVault CAmaintains and updates the CRL as certificates are revoked. The CRL is accessed using the Online Certificate Status Protocol (OCSP). The BlackVault cryptographic boundary is within the silicon of its secure CPU. This silicon die shield has dynamic fault detection with real-time environmental and tamper detection circuitry. It also avoids inadvertent tamper, making the BlackVault safe to transport. Critical security parameters, such as a certificate’s private key, are encrypted by an inaccessible Master key stored within the cryptographic boundary and zeroized if a tamper event is detected. The BlackVault CA has an integrated Enrollment over Secure Transport (EST) server. EST is a protocol defined by the IETF (RFC 7030) as a successor to Simple Certificate Enrollment Protocol (SCEP). EST is a modern approach to automatically obtain certificates in a manner that is secure and more comprehensive compared to SCEP. EST is designed to improve lifecycle management of certificates. The key advantages of EST are its ability to use Elliptic Curve Cryptography (ECC), and its use of TLS to securely transport certificates. One of the areas where EST shines is its auto re-enrollment, and redistribution features. EST clients are aware when their certificate is about to expire and automatically re-enroll for a new certificate, or if CAs or endpoints certificates get compromised in any way, after repairing the vulnerability, set the client to re-enroll and the device will automatically have a new certificate. Additionally, if the CA certificate changes, the EST client will notice the change and automatically obtain the new certificate. This process of auto re-enrollment and CA redistribution is faster and less work intensive than previous certificate management protocols. To make the BlackVault CA EST Server as easy to utilize as possible, there is an integrated Representational State Transfer (ReST) API to automate and simplify secure client key enrollment and renewal integrated into its core functionality. Through the RESTful API devices enroll, and renew certificates programmatically. Harnessing the power of HTTP, REST is an efficient, lightweight, high performance interface that is accessed by any device at a low bandwidth. allowing device automation, the reduction of time, and cost, as well as leverage economies of scale. The REST API is a faster, more efficient alternative to Simple Object Access Protocol (SOAP) and Web Services Description Language (WSDL). REST is focused on accessing resources through a consistent single interface. REST does not require expensive tools to interact with, allowing the REST interface to be accessed by any tool using any programming language that can utilize HTTP.